To make Cucumber Raita – combine all ingredients in a small bowl and refrigerate until ready to serve, up to 1 day ahead. To make Cauliflower Steaks – trim leaves from cauliflower and cut into quarters, cutting through the center/core. Cut each quarter into 2 “steaks”, keeping center core intact. Mix together olive oil, curry powder, salt, and lemon juice in a large bowl. Toss all 8 cauliflower “steaks” in mixture to coat. Coat a grill or grill pan with cooking spray and heat over medium high heat. Cook cauliflower “steaks” for 4-5 minutes per side or until charred and fork tender. To assemble pitas – place one leaf lettuce on sandwich thin and arrange 2 steaks to fit. 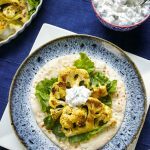 Top with Cucumber Raita and serve immediately.